Transform tired tresses with Vichy Dercos Nutrients Vitamin A.C.E Shampoo, a nourishing cleanser powered by the brand’s own Mineralizing Thermal Water. The deeply hydrating formula replenishes vital moisture to strands, smoothing the hair cuticle whilst providing antioxidant protection and restoring a healthy scalp environment. A potent blend of Acai Berry, Aloe Vera and Vitamins A, C and E work in harmony to deliver a range of nutrients to leave locks soft, shiny and visibly healthy. Free from parabens and silicones. Hypoallergenic and dermatologically tested. Apply to wet hair, creating a lather. Rinse thoroughly with water, avoiding eye area. 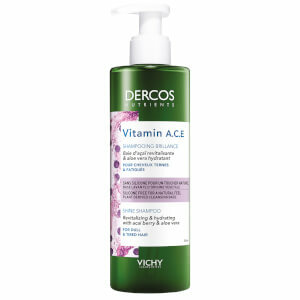 For best results follow with Dercos Vitamin A.C.E Conditioner. 1144827 B, Aqua/ Water, Ammonium Lauryl Sulfate, Cocamidopropyl Betaine, Glycerin, Sodium Chloride, Parfum/ Fragrance, Aloe Barbadensis Leaf Juice Powder, Alpha-Isomethyl Ionone, Ascorbyl Glucoside, Benzoic Acid, Benzyl Alcohol, Benzyl Salicylate, Carrageenan, CI 75310 / Beta-Carotene, Citric Acid, Euterpe Oleracea Fruit Extract, Glycine Soja Oil/ Soybean Oil, Helianthus Annuus Seed Oil/ Sunflower Seed Oil, Hexylene Glycol, Hydroxypropyl Guar Hydroxypropyltrimonium Chloride, Limonene, Linalool, Maltodextrin, Salicylic Acid, Sodium Hydroxide, Tocopherol.